The glass of Murano is synonymous with creativity and mastery, but also with tradition, passion and dedication, which with that same intensity, have been handed down from generation to generation. The history of Vetreria Venier began in 1938 when its future founder Enzo Laggia was born. Only two years later, in 1940, the family moved to Murano where the mother was hired by the Franchetti glassworks and the father worked in the production of conterie (the famous pearls of the Venetian glass). At approximately eleven years of age, Enzo as well entered into the world of glass as a strisaòr (stoker of ovens) in the Cenedese glassworks, then as a cutter and trimmer in the Marsiglio glassworks, as a grinder at the Vincenzo Nason glassworks and finally as a garzonetto (master’s helper) in the Seguso De Fortuna glassworks. Thanks to his in-depth knowledge of the material and working systems gleaned over the years, together with an intense passion and a great deal of willpower, Enzo (nicknamed Neno) began to work abroad as a sales representative and seller, travelling throughout Europe. However, his greatest desire was to have a glassworks of his own in Murano, and so in 1975, after having already founded the company Muranese Export in 1969, he purchased the former Estevan Rossetto glassworks and renamed it Vetreria Venier. While all of this was happening, the new generation of the Laggia family was making its way in the world of glass, working under the tutelage of their father and then directly in the glassworks: these were Enzo’s two children, Elisabetta but especially Marino Roberto Laggia who made the passage of the company from a strictly craft-oriented environment to a highly internationally- focused one possible. It was he, as a matter of fact, who spurred the glassworks to focus its efforts on the select and exclusive clientele who, at the beginning of the 1980s began to crowd the most exclusive hotels in Venice. This opening combined with a great entrepreneurial intuition, not only made it possible to make the Venier brand well-known within the international jet set, but also to create a new typology of glass artworks, which were more sophisticated and particular, in order to satisfy the most refined tastes. Always following this philosophy, the glassworks began important collaborations with affirmed artists throughout the world, adding an exclusive value to the works and breathing new life to the already fervent creativity of the master glassworkers of Venier who, from Pino Signoretto to Walter and Mario Furlan, Luca Vidal, Fabiano Amadi, Giuliano Tosi, Andrea and Fabio Tagliapietra have always been selected among the most excellent names of Murano. The year 2000 marked another important date for the glassworks, when Marino decided to enlarge its exhibition spaces making Venier’s showroom one of the largest and most diversified of the entire island. Here, in addition to the works created and made by the master glassmakers in the furnace, outstanding works in glass also began to be added, which are, still today, chosen by the glassworks senior managers only after a strict and thorough selection. As Enzo and Marino love to point out, however, the bond of trust and esteem binding together all of those who take part directly in the activities has always been the strength of the company. Among these we ought to recognize two pillars, the general manager Alberto Fantin and the director Roberto La Rosa, who have been providing valid support to Marino for more than thirty years. Without forgetting Marino’s wife, Valentina, who has been working alongside Marino for more than 25 years in such an irreplaceable way and his brother in law Salvatore responsible for the commercial sector. 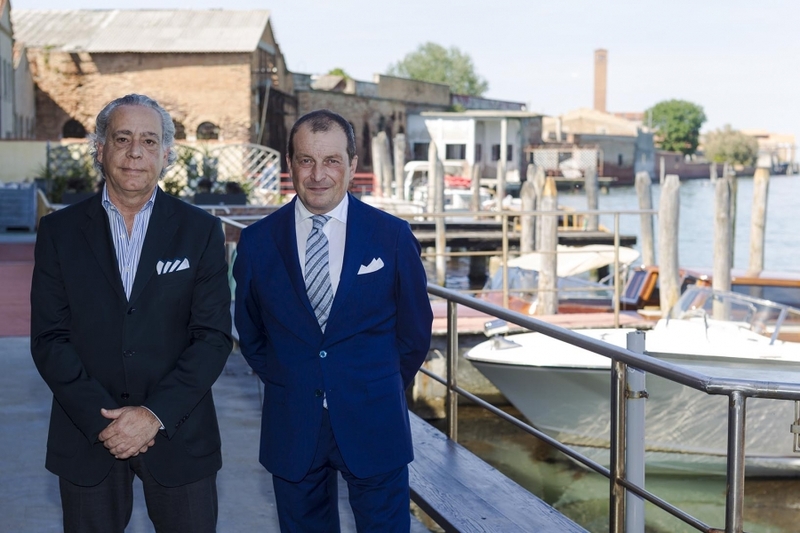 Besides them, moreover, his grandchildren Nicola Laggia and Dimitri Piccolo represent the new generation and embody the continuation of an enterprise that has now marked its fiftieth year of life. Their story is also similar to that of their parents and grandfather since they have always lived and breathed first-hand the work and the activities of the glassworks. Furthermore, Nicola enriched his experience with several stays in the United States and England during which, thanks to his global business studies, he has laid the foundation for what the future of Venier will be. The aim in the upcoming years will consist in making the glassworks increasingly better-known in Italy and abroad, not only through the works in glass but through the creation of a real and genuine brand able to blend together, in an exceptional combination, creativity, quality, craftsmanship and its ability to stay abreast of the times, hallmarks that have always distinguished the company. However, Nicola and Dimitri shall then develop in time another great project, already begun by Marino, that came true by purchasing some adjacent glassworks in order to further expand its showroom space by the year 2019. This will make Venier the largest, best-supplied and most exclusive glassworks in Murano. A centre of excellence that crowns the commitment and dedication of a good three generations.